It’s not every newcomer to the JSE that gets off to a good start. But one that certainly seems to have done so is Acsion, the specialist property developer and owner. 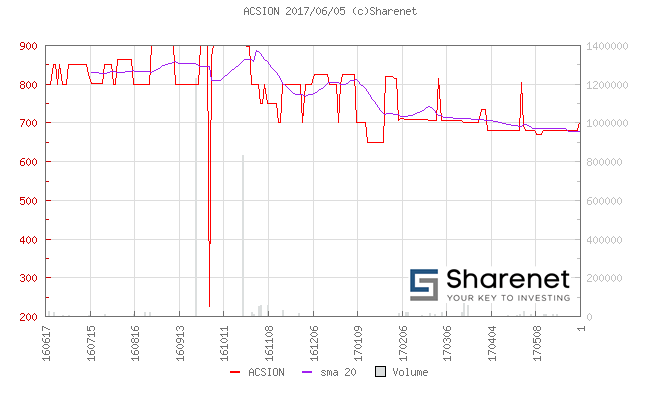 Acsion came to the market two years ago and is building an enviable profit record. "Acsion believes it is a business with ingenuity, vision, value engineering and effective management". And the latest profits certainly prove their point. Through their development activities, Acsion is able to generate annuity income and capital growth for its shareholders. Group liquidity appears to be adequate, while the NAV per share increased from R11.60 to R13.60. The current share price of R6.80 is almost half the NAV and appears to offer good value. Even though it has always been the group’s policy not to declare any dividends, the board of directors has proposed a dividend of 12.5 cents per share based on the company’s recent profits and low gearing. "Acsion’s board remains confident that the group’s growth objectives can be achieved despite the challenging economic operating environment. The company remains focused on the completion of its secured development pipeline over the next three years. Acsion will continue reinvesting in its existing portfolio and focus on its development expertise to ensure above average NAV growth", says CEO Kiriakos Anastasiadis. For the future, Acsion will explore further development opportunities in high-growth markets in the rest of Africa and Europe. Acsion continuously evaluates a consistent stream of new opportunities, and is in advanced discussions on certain projects to further enhance capital growth in the coming five years. Two of the major shareholders in Acsion are Ioleni Trust and CEO Kiriakos Anastasiadis.